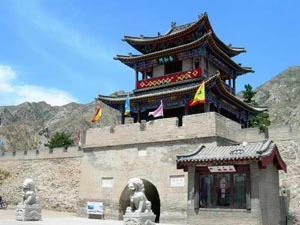 Meidaizhao Lamasery (měi dà zhào 美岱召) is located around 80 km east of Baotou city (bāo tóu shì 包头市), lying in Meidaizhao Village (měi dà zhào cūn 美岱召村), Tumd Right Banner (tǔ mò tè yòu qí 土默特右旗) at the southern foot of Mt. Daqing (dà qīng shān 大青山), roughly midway between Baotou and Hohhot (hū hé hào tè 呼和浩特). 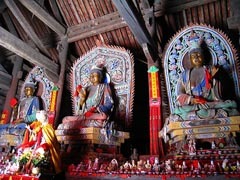 It was one of the most important centers for spreading Tibetan Buddhism in Inner Mongolia. Meidaizhao Lamasery was built in CE 1575 by the Mongol leader Alatan Khan (ā lā tǎn hán 阿拉坦汗), a direct descendant (17 generations removed) of Genghis Khan (chéng jí sī hán 成吉思汗), during the middle part of the Ming (CE 1369-1644) Dynasty (míng cháo 明朝). The lamasery served as the official residence of Alatanhan as well as serving - as it continues to do - as a Tibetan-Buddhist temple for the people (the Mongols as a group embraced the Tibetan variant of Buddhism, which incorporates elements of earlier, pre-Buddhist religious beliefs, just as mainstream Chinese Buddhism came to incorporate elements of both Taoism and Confucianism), and the lamasery also served as a fortress during a very troubled period (the Ming Dynasty became increasingly weakened as corruption spread to all levels of government, and challenges to the sovereign became as correspondingly widespread). The architecture is a mixture of Central China style with Tibetan and Mongolian features. It covers an area of 4,000 square meters, and contains temples, royal palaces, enclosing walls and city gates. Meidaizhao Lamasery is more of a walled city than a lamasery. The Lamasery is surrounded by long and thick walls with a total length of 681 meters. Watchtowers are built at four corners of the walls. This design will help protect the city from outside invasion. 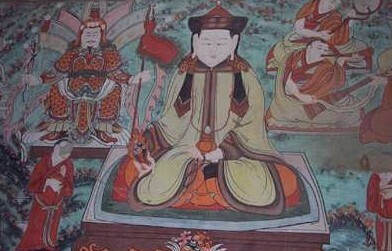 Meidaizhao Lamasery is of great importance for the study of Mongolian history of religion, architecture and arts in the Ming Dynasty. Upon entering the gateway to the lamasery, the visitor is confronted with the main hall, the Hall of Sakyamuni (Sakyamuni being the founding father of Buddhism). Highly esteemed and very colorful frescoes depicting traditional Tibetan-Buddhist themes adorn the walls of the Hall of Sakyamuni. Next to the main hall is located the three-storey-high edifice in whose chapel, or prayer hall, Alatanhan and his wife regularly worshipped. 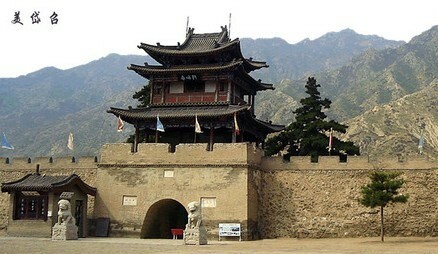 Inside the wooden tower of Empress Hall stored the ashes of Alatanhan's wife (Sanniangzi). Every year on May 13 of lunar calendar, there is a traditional Meidaizhao Temple Fair. The fair lasts about a week’s time. People from all quarters gather here, not only for worshipping or sightseeing, but also for trading and selling local products and agricultural produce. 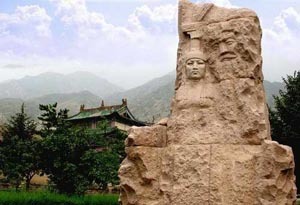 As indicated, Meidaizhao Lamasery is situated within the confines of Meidaizhao Village, which is a noteworthy tourist site in and of itself, given its Mongol heritage. Visitors who overnight at Meidaizhao Village can choose to reside with a Mongol family and thus experience first-hand what authentic Mongolian lifestyle - albeit, as it is lived at present - is like. Location: 50 km east of Baotou, Inner Mongolia, China. How to Get there: You can reach Meidaizhao Village/ Meidaizhao Lamasery via the regular bus service between the cities of Baotou and Hohhot.